Every year at Easter we have something special to help people who don't usually come to church encounter Jesus. In churches across America, Easter Sunday is the most attended service of the year. It's a cultural event that makes people more open to coming to church. We usually have about a 50-70% attendance increase at Epicentre! The openness at Easter time is a sign that many people are searching for a significant connection with God. But, the fact that they only come once a year is a sign that there are still barriers to them following Jesus! To address this we present an Easter message that is accessible and compelling for our guests, and we create a community atmosphere where they can connect with people. We believe that people will encounter Jesus through worship, teaching and relationships with believers. God has placed us in jobs, schools, and neighborhoods with people who are in darkness. Let's ask Jesus for specific people that He wants us to minister to, and how He wants us to do it. Let's pray for them daily and look for opportunities to extend Jesus' love to them. The Easter service is a great way to engage them with the message that Jesus is the Light! Every year after the service we have a giant picnic on the lawn. Food is $7 for adults, $4 for children. Bring your picnic blankets! 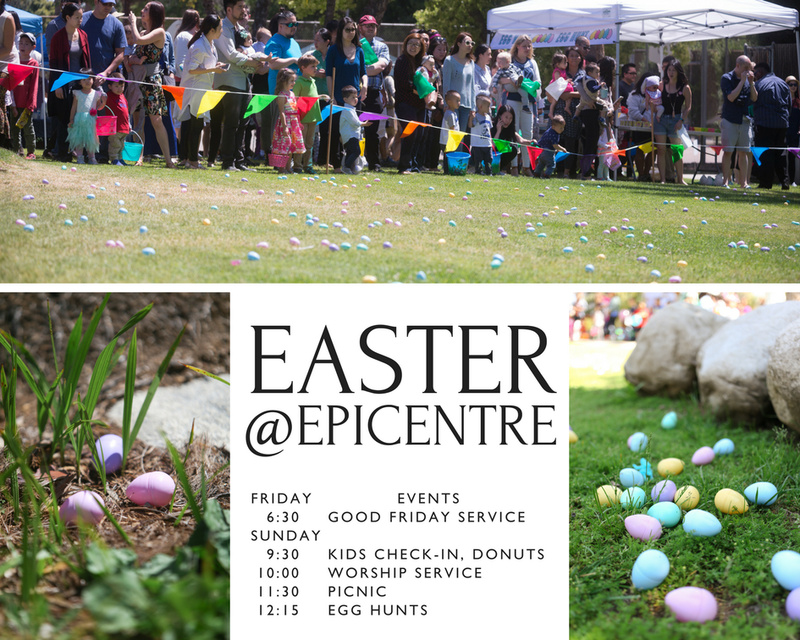 At 12:15 we roll out our epic Easter egg hunt! We have three hunts for three different age groups (up to grade 5 only). Kid's love it! The Holy Spirit broke through in powerful ways on so many different levels during our retreat! It was beyond what we could have hoped for and imagined. There was crazy freedom during worship marked by dancing, cheering, shouting, crying. Youth were encountering God’s presence. There were many tears, some felt the physical presence of God, and some even received visions from Jesus. Our speaker Chris Rattay spoke on letting Jesus heal our fears and brokenness so we can address the fears and brokenness of the world. During our small groups many shared vulnerably about insecurities and confessed sins. Youth responded to the altar calls after the messages: to lay down their fears and pains, to surrender the idolization of what others thought of them, to rededicate their lives to Jesus, and to commit to share His message on their campuses. There were 13 students who decided to follow Jesus for the first time, 5 accounts of physical healing, 7 who expressed the desire to get baptized, as well as students testifying about new life and hope from depression, loneliness, drug abuse, bulimia, self-hate and suicide. One student struggling with drugs and an eating disorder felt God’s power break through pain in her body when she cried out to God. Another who was struggling with rejection and recently hospitalized from an attempted suicide said she has now found a home in the youth group. Another student who accepted Jesus at the retreat saw a vision of God’s hand reaching out to her, giving her peace from her fear of facing her Buddhist family at home. In he midst of all this, wonderful friendships formed! Since the retreat, students are already telling their friends about the retreat and forming accountability groups on their own and in their schools. We are blown away by the goodness and love of God for these students and we believe that this is just the beginning. Reflections: What is God telling me about Epicentre? • God is telling me that Epicentre is my tribe. That I have an extended family I can depend on and that won't leave me. God is showing me that I'm able to pour out to others in part because I receive so much from this tribe. • I love my church. I love my people. Sometimes when you get paint on your hands, things get messy, but my desire is to see many people with paint in order to make a beautiful painting together with many different colors. • Epicentre is place of safety and growth. We are found secure in our identities which allows us to be accepted as we are. • 4 walls are not required to be a family, home is not defined by 4 walls...at Epicentre, our family is a pulse that has a ripple effect from person to person, neighbor to neighbor. • Epicentre is where I'm supposed to be right now. It's a resting place and a refuge from the busyness and stress of college. This community gives me a chance each week to reset and focus. • I love her she means the world to me. She's the bright morning star. In my father's house there are many kings and queens. She's going to dream my dreams and everyone one of them will come to be. She's the apple of my eye. I can't stop looking at her. I've locked my eyes on hers forever. • You are builders. And you're in a construction season: there will be deconstruction and reconstruction that occurs...but you will stand together. • I saw an image of a flower bud that was slowly opening up into a beautiful flower. God's saying that Epicentre will be blossoming soon. Also God said to open up the gates. Not sure what that means exactly. • Epicentre is apple of my eyes. It is indeed an Epicentre radiating out My fragrance and influence to the earth. • God told me, "I love Epicentre." • I am giving you abundant waters to drink from and be restored in this season; my waters will flow through Epicentre. • God told me this church is a big church of love. Then I received an image of a plug, which had many silver parts sticking out of it. It plugged into a special outlet that light up a huge sign that said "A Big Church Of Love" And as a 1st time, temporary visitor - I see that and feel that love of Christ through the church body immensely. • We are co-laborers in the world for God to be displayed and for those to know Him. Co-laboring is collaboration. We must work with other organizations to combine resources to do the work. This should impact how we view this campus. • Epicentre is a place of love for you. • As we are being parented by God, we are called to parent a new generation of believers. • Be uplifted! Be cheerful! Laugh! Enjoy My Presence. Enjoy My Love. Live and rejoice in Me. Be free to prophesies and be encouraged by professing. • "Don't be afraid to give yourself to what I am calling you to. I am with you to the end and always. The sacrifice is always hard but I will gladly help you carry your cross. Do you not know that I am sufficient for you? (Smiling)?" • "You may feel like you're sacrificing a lot but this journey and adventure is so worth it." • I got a picture of a playground. God said "there are many. My church is much like these structures. High points. Low points. Points that require group effort and points that only one person can go at a time. The point is, I want to invite you into a state of play and laughter. Others will see your team work, love, joy, and innovation of different ways to play together and want to join in the game. It is easy to invite others in when you are in the state of play. There is joy in my presence. • A spiritual volcano. I see a picture of a volcano where spirit breaks out and fire burning lifting incense up to heaven. • In God's face is delight, joy, overflowing laughter for this church. • "Invest in the youth... they are the future." • God told me yesterday: you are home. • Image of a soda can being popped open. It is new, refreshing, light. • You’re home; Follow, hold tight. • Epicentre my child, I'm smiling over you now. My heart is for you to live with deep emotion and burning passion from your heart. To rejoice with those who … strength. • God is telling me this is my new home church and I need to invest my time here. • Epicentre may not be perfect but it is a safe place for my heart. • I felt that God was speaking over my family and myself. The sense that we would acquire a lot of spiritual tools and blessings. And be stretched and taught. All over the course of many years. And that we would give back to this body and be poured out completely with what we have been filled with. I got the words "sowing and reaping." • I will use you among many nations. • Epicentre is a place of peace. • Other situations that need to prayed for. For I know there is a group of single women who would love to be in a group where the prayer is directed towards. • I created you in your own way to serve me and my people , so there's no need to compare yourself. • I love you. I want Epicentre to flourish. • "This is where I want you to be. I have things for you to learn and ways in which I want you to grow. I made this place easy to find so you would know that this is where you be long." • Epicentre is a safe place, the family I've given you. let your family love you. • God is telling me that Epicentre is home. A safe space where I can lean into the spirit of God and receive love and healing. Epicentre is family that I can trust. • A shelter for me at times of fatigue and with hidden treasures where God has intended for me to explore. • He told me, "Stay at this one." • "No one has to be afraid of jK or condemnation with their family." • God is doing something at Epicentre beyond what you thought it would be. • Epicentre is a place that knows the importance of family. Where people check their pride at the door and shape leaders who will shake the foundations of this nation and world to turn toward God. • I just moved here from Arizona and have been searching and searching for churches and felt a tug to come to church today so I'm here and just felt like God say this is your home this is where I want you. I want you to thrive here and build a foundation here at this church. I'm so so loved because I've been so lost for the pst two months of where God wants me and He wants me here at Epicentre and I'm so so thankful that god brought me to California and sent me on this trip then sent me here on Sunday to finally here where He wants me. God is so good and He never fail. • You will overcome and this church will be strong. • Epicentre is your root, where I have planted you. Your seed is being watered at Epicentre. Epicentre is helping you to see people through My eyes, not through segregated eyes. It is breaking down the South. | Epicentre is the center of God's heart. Through Epicentre people receive Jesus Christ and through Jesus Christ, people receive Me. • God dwells here in this house through the hearts of each and every one of you. • There is a time and season of everything under the sun. I have a place for you to encourage and bless.. to lift up and pray.. to grow and mentor... to u | She's a place of healing and rest/restoration... a birthplace of revivals... a place where the Kingdom's graces are extended, a home for the hungry with a foundation of love. .. a place where miracles abound. • We are home! No more fear of intimacy in family. Freedom to belong! • Thanks for sharing the pure love of God. • "These are the are the people I've called you to love. They are your family. They are your friends. They are your community." • Chaos will be occurring all around Epicentre, but our church will stay where it is and stay strong through it all. • Jeremiah 33:3 - Call to me and I will answer you and tell you great and unsearchable things you do not know.’ | For Pastor John, "You will raise a generation of hunger seeker that will bring forth revival in this city.... hungry. • Casa – house in Spanish. • Epicentre will invite PIHOP back. • About Epicentre: A picture of a family sitting around a dinner table sharing highs & lows of the day. The family of God does day to day life together sharing in the good and the bad, the powerful and the mundane | About me and Epicentre: This is a space of SAFETY to grapple with messy things like doubt, fear, vulnerability, and insecurity. Family wants to know, to wrestle through it together, and family stays no matter what. • Isaiah 41:10 And - keep your eyes on me. • The fruits of your ministry teams will be plentiful. The teams that are going and serving will be prosperous. And the Lord is moving through epicenter and it's teams. Never take for granted the strong community you have in this church. The devil uses division as strong tool to tear apart bodies Christ. • I see so much renewal and joy in worship. There is so much more of God's presence coming upon us as we worship Him together, so much celebration as heaven joins in. I feel the invitation to be wide-eyed and hopeful like children, and to approach God with both awe and complete abandonment. I see puddles of his presence pooling at the front of the auditorium. Will we jump in and splash around? Come meet us on the lawn after church for lunch, fun activities, and a chance to connect to ministries and lifegroups. Join us for an exciting event focusing on practical cooking ideas, tips and recipes. We will have cooking demonstrations (fast, easy and healthy meals, yummy desserts, instapot! ), eating, fellowship and prayer. It has been my joy and privilege to serve as the Children's Ministry Director at Epicentre for the last 8 years. However, over the past couple months God has been speaking to me and made it clear that He has something different in store for me and for Kingdom Kids. I will be stepping down from the position of Children's Ministry Director and Epicentre will seek a new full time Director. I will become the Assistant Director, focusing on the preschool ages, as soon as we can install a new Director. This will allow me to be able to focus on my areas of gifting while pursuing my passion to see kids know Jesus and come alive! I was looking back through my past journals and found a prophetic word I was given last year. It was a picture of someone building a house: "Building a house is a lot of hard work and labor, but then there is a time to live in the house and enjoy it." As the Kingdom Kids ministry has grown from 20 kids to over 120 kids over these last 8 years, I have rolled up my sleeves, dug in, built, cut, built again, torn down, added on, painted, and polished this house multiple times. I have had to allow God to grow my capacity with each new child, family, added class, building, location, team member, intern, and event. God has been faithful every step along the way. In my facetime God said to me, "Well done, good and faithful servant. It's your time to rest, to let go, and to live in the house and enjoy." God has been showing me that my building phase is over and that it's time for someone else to come and build on to the house and foundation. tepping down is another stretching decision for me, but I believe and trust that God will continue to expand the tent pegs of Kingdom Kids and that it's not up to me or any one person. “Unless the Lord builds the house, They labor in vain who build it.” (Psalm 127:1a AMP). Kingdom Kids was and is God’s idea in the first place and He has taught me to hold it loosely. This new role for me is part of God’s unfolding story in my life and in the Kingdom Kids ministry and I look forward with excitement to what God has ahead. Our Fall DSchool launched earlier this month with nine students. We will be taking the next five months to delve deeper into their relationship with God and get equipped to be world changers. Pray for them as they go on the kickoff retreat this weekend. Our next Dschool will launch in February meeting Sunday afternoons and one Saturday a month. For more information, check out epicentre.church/dschool. It’s hard for me to believe that 2017 is around the corner. And … this year, New Year’s is on a Sunday. This only happens once in a while (the last time was in 2011). As Christmas is a time to celebrate with family and friends, New Year’s is a time to reflect and look forward to what the new year will bring. 365 days is a long time, but it also goes by quickly. I’ve often found it helpful to take time in the week between Christmas and New Years to invite God into the coming year. Here are some things we do to transition into the new year. Make space to be quiet and reflect on the past year. I take a couple of hours to look at my calendar, and read over my journal. Take time as a family to look through our pictures and videos we’ve taken in the last year. Josh, Evelyn and I sit in front of our TV and take turns streaming our photos to it. This gives us time as a family to laugh, and remember things that happened: places we went, food we ate and friends we spent time with. Ask God to speak words or a verse to us about the coming year. Because 2017 is a blank slate right now, asking God to speak in advance is a powerful way of us entering into the New Year with intentionality and purpose, not just letting the New Year happen to us. Along that line, if you are in town, I’d like to encourage you to come to Epicentre on Sunday morning, Jan 1, at 10:00 a.m. I feel like God’s given me a special word that will minister to our hearts as we come together on the first day of 2017. We’ll hear from God’s Word, take communion together and ask God to speak to us, meet us, and sanctify us for a year that He already knows about. We'll also have our full Kingdom Kids ministry available. If you’re not able to join us (because you’re at home during the holidays or away on vacation), please listen to Jan 1’s message via our app or website. Every year Epicentre receives a significant portion of its tithes and offerings in the last week of December. We encourage everyone to update their tithes and give generously to what God is doing at Epicentre. For charitable donations to be counted in this tax year, and to balance our budget, we encourage everyone to make sure checks are postmarked by Dec. 31st, and online giving is completed by 1:00 p.m. on December 31st. (Credit card transactions can be processed later, but bank transactions close earlier in the day!). Updates from Germany: The harvest is here! Our first Engage the Crisis teams are on the ground in Germany! Several planes, trains and buses later, they arrived after a 3 day training in Amsterdam. "The shout of “Hallelujah!” resonated from several team members after an amazing day of outreach yesterday. A Syrian couple, “H,” and “M,” whom we met at a cross fit gym, invited some of us to meet with them. During our conversation, "H" shared that since she was a little girl, she's had recurring dreams of a man dressed in white motioning her to come to Him. The husband also shared a heartbreaking story of being imprisoned and tortured for months in Syria, and fleeing to Europe after being released from prison. After some time of sharing, "M" showed our team a message on his phone using a translation tool: "Can you tell me how to become a Christian?" What an amazing moment! Both of them received Jesus and committed to follow Him! The Harvest is ripe and we are privileged to harvest the fruit! Another team went with the college team to visit a Syrian refugee center that houses 1100 refugee residents. We were warmly welcomed and spent hours playing games with kids and talking to the women. This center was receptive to having volunteers come and help - we feel that the Lord has opened a wonderful and strategic door for future teams to come and serve." A residential refugee center called a "heim"
Before meeting Jesus, I was a pretty violent guy. I cursed a lot. I didn’t want to talk to anybody. God changed my life and now I know that He’s real. When I pray to God, He talks back to me. I got more intimate with Him. Now I’m open to new people. I’m really caring and I love praying for people! If you need prayer, just ask me and I’m there for you! I love to love on people. I’m passionate about worship. I love singing songs. There’s a song that says, “His Love Never Fails.” It’s true because God’s been there for me through good times and bad times. My dream is for the world to be peaceful. I want the sun to shine everyday, and I want the violence to end in my neighborhood. My dream for the entertainment industry is for God to encounter the storytellers of Los Angeles. My desire is to hear people tell prophetic stories, honest stories, and for people to ask questions about humanity and life through art and film. I would love to see a shift in the content of the films that are getting produced. The entertainment industry is so important because it informs how we live. Life imitates art and art imitates life. The industry has the power to tell you how to dress, how to speak, how to live your life, what to care about, what to pursue, and what to expect from love and family. I have a strong pull towards content that is truthful and that is not afraid to ask questions about God and life. Ultimately every screenwriter writes a screenplay with a question. "What happens if?” Unfortunately there’s a lot of good storytelling that has been sacrificed for finances. If we can restore the purity of storytelling back to truth-telling and honesty, rather than making a fortune, it would be so impactful. We need to tell stories that matter, because these stories encounter people. Film has a global voice to do this in our world. The Gospel is in all of our stories, because Christ is redemption. Christ is truth. Christ is in forgiveness. If we’re telling stories that are honest and good, that’s a reflection of who He is and his desire for humanity. I grew up in Toronto, Canada. Before I knew Jesus, my life was pretty self-centered. Everything I worked towards in high school and university was about making myself happy with material goods. For several years I worked in the internet industry - I was immersed in a workplace that was driven by success and ambition. It was a gradual process of Jesus changing my life. I remember going on a missions trip to the Philippines. I saw a man who owned a fish farm. all he did was feed the fish once a day, and then he’d spend the rest of his time going through his neighborhood telling people about Jesus. This changed the way I looked at things. I felt that my life needed to have an impact on eternity. The trip to the Philippines solidified in my heart that I wanted to give my life to ministering to others. At the time I was volunteering in my church doing youth ministry with Charmain. My life really changed when I got a job offer in Austin, Texas, to do youth ministry full-time. We were able to obtain work visas smoothly and we knew that God was blessing us to go. For most of my life I was a Christian living for myself. Then I became a Christian truly living for God. While I’m still on a journey, and while I’m not perfect, I do have a desire to see others come into a relationship with God and be changed by His love. My heart has changed towards people who are different than me and who come from different socioeconomic backgrounds. God is breaking down my barriers in my own heart towards those He has called me to love and to serve. Serving at Marshall Fundamental School is an opportunity for us to make a difference. Education is part of the fabric of our city. Everyone goes to school. Schools in our city have great needs. My desire is to encourage this school, to serve them as best as I can, and to find families in need who live in Northwest Pasadena who send their kids to Marshall. We’ll also be working with the Christian Club as well. We’re also seeking to practically meet the needs of the school - through mentoring, tutoring, and mobilizing resources - to make Marshall Fundamental a great school in our neighborhood. The spirit of what we want to do is - to get in there, get our hands dirty, and to be committed over the long run - to a community in need. This is a way for our church to change our city. Recently we went to the Getty Center. I saw a painting of Christ’s triumphal entry into Brussels by the artist James Ensor. It’s a captiviating yet disturbing image. In the chaos and the craziness of the painting, it’s difficult to see Jesus. But if you look carefully, you’ll see Jesus in the midst of the revelry, riding a donkey. There are people defecating and throwing up and partying. It’s a commentary on our world. There are people who profess to be Christians, but really don’t welcome the coming of Christ into the city. This painting makes me think of Christ’s triumphal entry into Jerusalem and the celebration of the King coming and how that changes the atmosphere of where we live. Jesus is the Messiah, the Healer, and the Bearer of Good News. My dream is that Christ will be genuinely welcomed here in the city. I have an image of Jesus riding a donkey down Lake Avenue in Pasadena and people ushering in the Beloved King. My dream is to see an end to violence in our neighborhood. My dream is to see an end to the drug dealing, dependence on drugs, and an end to fatherless. I would love to see families made whole and for there to be peace instead of hopelessness. I dream that our neighborhood will be changed by the church and through Christians living there. I got saved when I was a junior in high school. I was a wannabe gangster but I really didn’t know who I was. One day I was arrested shoplifting with the wrong crowd of people. God really used that day to get a hold of my life. I realized that if I continued down that path, my life would be bad news. From that point on, everything changed. Somehow I had grace to say no to being in a gang. I was able to reject the gang lifestyle and found a community of Christians who loved me. As I began to give my life to God, I found out who I really was. For most of my life, I wasn't interested in academics. I didn’t think that I’d even pass high school. But I discovered that my talent to draw and produce art was something that He could use for the Kingdom, and so I decided to go to art school here in Pasadena. My life change when I began to understand the Father's heart and see the beauty of God. I’m passionate about people seeing the beauty of God through art. My dream is to use art to impact the nations and share the Gospel. I am called to co-create with God and I want to help others do the same. Artists are special people; we’re trend setters. What we draw becomes the future. We tend to be twenty years ahead of society. But the Enemy also loves to attack artists. You look at Hollywood and the amount of evil that is pouring out of the entertainment and creative industry. Why can't we have other models for beauty, art, and entertainment? I'd love to illustrate children's books. I’m passionate about creating children’s books, even though I’m scared of kids. Kids are like sponges, and I want to impact them, especially in a world where they're so exposed to so much junk and sin. Stories use our imaginations to convey truth, and it's a powerful tool. My name is Kin, and I think the meaning of my name is special. While I’m an only child, God has made me passionate about encouraging brothers and sisters in Christ and building 'kinship' in the church. My prayer for our community in Southern California is for the walls between races and classes fall down. There is so much segregation, even in the church. But I long to see unity in God's family. When you have unity, God commands a blessing (psalm 133). With unity of the believers, the Enemy is powerless. Paul: "I came to know Jesus in 1982. I was a sophomore in high school. I was an atheist at the time, but I didn’t tell anyone because I didn’t want to upset my parents. I started going to youth group at our local church, and I saw people worshipping in a way that it was clear they really believed in God. I couldn’t explain it, because I thought the idea of God was ridiculous, but it caused me to pay closer attention. In a youth group Bible study we began to study Romans, and as I read it, I found it very compelling and exciting. Jesus explained the world in a different way and different reality that I was really attracted to. And it was a better explanation than anything I had ever heard before. As I started to follow Him and study Him more, I realized that I was valued in a way that I had never understood. That made me want to follow Him more and do the things that He was doing. My life is so entirely different than it would have been had I not met Jesus. My career, where I chose to live, and the way that I see myself has changed. I used to measure myself on a grid of how I did socially - how smart I was in school, how much I could succeed in - and this was how I measured my value and self-worth. God has freed me from those measurements. I look at myself in a different way." Rebecca: "My Korean name means "purity; one who will become great." I grew up hearing from my parents that one day, I will be great. When Jesus won my heart over, my pursuit for greatness changed. Instead of pursuing the things that the world glorifies -- fame, self actualization, an amazing career, wealth, and success -- I've learned that the Kingdom of God is an upside down kingdom. Jesus said, “If you want to be great, you must be a servant and least of all.” I love that Jesus doesn't reprimand us for wanting to be great, but He showed us a path to greatness that is different from the world. Greatness in the Kingdom of God is through servanthood, loving other people, and becoming the least. He has been purifying what greatness means. I want our kids to be great. All parents want that for their kids. But the path to greatness is through serving, and through caring for those who are the least. I was blessed to be raised in a Christian home, so I would say I've always known Him. But there did come a point where I felt an outpouring of God's comforting love, leading to me understanding who God really was. Before that I felt purposeless, like a ship without a sail. All my striving and achievements were meaningless. Pascal wrote, "There is a God-shaped vacuum in the heart of every man [and woman] which cannot be filled by any created thing, but only by God the Creator, made known through Jesus Christ." Because of I have a personal relationship with Jesus, my vacuum is filled with peace that transcends all understanding. I do not have to feel empty, alone or unfulfilled. When I didn't know Jesus, I was like a ship without a sail, drifting aimlessly with the tide of a rough sea. Jesus has made me passionate about service. He said, “I have set you an example that you should do as I have done for you" (John‬ ‭13:15).‬ Jesus washed his disciples dirty feet. As an Athletic Trainer, I get to tape people's nasty blisters and soothe their broken bones. I am passionate about helping others succeed in the goals they are striving for. In my personal life, I seek to put others before myself, lay down my life for my brother or sister. My dream is that people would come to know God through the example of sacrificial love. In such a me-centric society, selfless love and patience towards our neighbor can be a profound testimony towards conversion. I dream to see all my family and neighbors at the biggest dance party ever in heaven. Many come to LA to study or to "make it" in entertainment. Therefore, I see LA as the training grounds, launchpad for soldiers in the kingdom of God. I long to see Christians infiltrate education and entertainment to influence the world for God.